#10 Best LEGO sets under $100 in 2019. LEGO isn’t just for kids so we have picked out 10 of the best and cheap LEGO sets you can buy right now for under $100. Over the years, LEGO collections have become some of the most recommended toys for kids, allowing children and big kids (and adults too) to build whatever attracts their eyes. As a result, LEGO has taken the responsibility of creating as many different LEGO sets as possible, including Star Wars sets, Marvel Super Heroes sets, Architecture sets, Harry Potter sets, and many more. Due to so many LEGO kits and collections available on the market these days, it has become tough determining what you can get. So to make it much easier, below we have prepared a comprehensive list of the top 10 best LEGO sets under 100 dollars to help you get the best possible options out there and the best value for money. Looking for the best LEGO sets for your kids to help stimulate their brains and encourage creativity? Then you have come to the right place. Below we have prepared an extensive overview and comparison table of the top 10 best LEGO sets under 100 dollars for 2019. The pieces are sturdy and excellent quality. Stimulates creativity in the process. The instructions books included are easy to follow and very clear. Comes with 310 pieces to build whatever the kid wants. Does not need any batteries to operate. The small pieces can be dangerous if there are little kids around. The LEGO City Heavy Cargo Transport Set is one of the best LEGO Building kits available on the market today. This set comes included with more than 300 blocks and accessories for constructing a heavy truck as well as the truck driver to handle the truck. As the construction progresses, a trailer carrying a payload for the building site assembles and the rest of the trailer holds the helicopter – the pilot will then fly the helicopter to the location when he arrives. The toy helicopter with opening cockpit and spinning rotors, as well as the flatbed trailer, are included to complete the building kit. The package comes included with 4-project bags, two manuals, a base plate, and a small sticker sheet. The two manuals included are in categories; the first manual is for putting together the trailer and helicopter with bags 1 (trailer) and 2 (helicopter), and the second manual is for assembling the tractors using bags 3 and 4. All the four bags comes included with everything your kid needs to construct the LEGO City Heavy Cargo Transport. It is recommended for ages 5 through 12, which makes a great birthday gift for your kid. The interesting part is that these toys are compatible with all LEGO building sets for creative construction of a wide range of vehicles including trucks, cars, and ATVs. 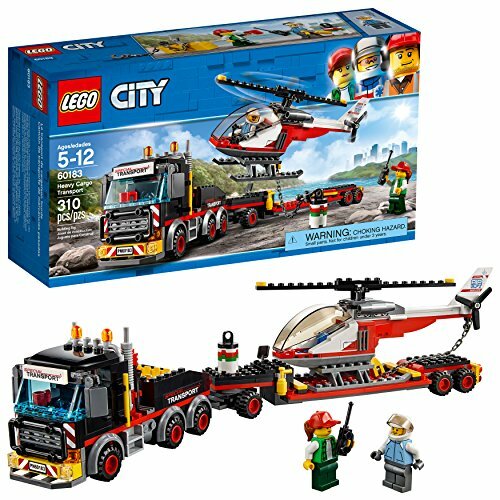 Bottom line: If you are looking for the best LEGO set under 100 dollars to keep your child entertained when you are not around the house, then the LEGO City Heavy Cargo Transport Set is an excellent option. The trailer design with an articulating hitch is perfect, and the helicopter is impressive size for the children to play with. Features a reasonable price tag. The bottle design is attractive. The display stand includes a compass, which is a nice additional detail. Stunning durability and overall quality. The ship could have come with more details. The LEGO Ideas Ship in a Bottle Set 21313 is another amazing building LEGO set that most LEGO enthusiasts have been waiting for a long time, and now, it is finally here. The idea of a Ship in a Bottle was initially submitted by a LEGO enthusiast known as Jake Sadovich, who received the support of about 10,000 from other fans needed to reach the next phase in just two months. This model released is considerably smaller than the original model submitted by the LEGO fan. 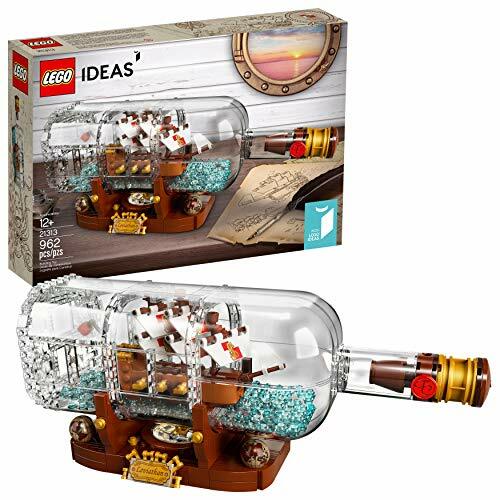 The LEGO Ideas Ship in a Bottle Set is a perfect mix of craftsmanship and art – it comes included with 962 pieces which when they are brought together, they yield a miniature sailboat inside the bottle constructed of transparent LEGO bits. The building kit comprises of four groups of bags – the first and second bags contains the parts to put together the ship and clear parts for building most of the bottle. The other two bags comprise translucent light blue round plates and bricks required to finish the bottle. Also, the set includes a detailed instruction booklet to help in your building process. Bottom line: The LEGO Ideas Ship in a Bottle Set is exclusively one of the most unique and virtually impressive LEGO Ideas which is not only fun to build, but it also utilizes some advanced techniques and elements. If you are amongst the LEGO fans and looking for something that allows you to produce a selection of unusual sets, this LEGO Ideas set will be an absolute delight. Encourages and inspires free building and imagination. Suitable for new builders and LEGO enthusiasts. Not suitable for small kids under 4 years of age. The small parts are hazardous – they can cause choking. LEGO never stops to amaze its fans by introducing new classic sets every year. This universal set is one of the most virtually effective options on the market. The LEGO Classic Large Creative Brick Box comes included with about 790 pieces and features 33 numerous colors which will spark the imagination of the LEGO enthusiasts of all ages. Additionally, it comes included with different windows and doors, and other unique parts including two green baseplates, six tires, six wheel rims, and three eyes’ set which allows you to put together a scooter, a house, and a bird. The beautiful thing about the LEGO Classic Large Creative Brick Box is that it allows for a lot of creations and can also be used by two or three builders at the same time. This building kit not only helps your child to focus on building LEGO creations, but also helps him or her to gain problem-solving skills and social interactions as they get older. It is one of the only creative LEGO sets which brings the entire family together to develop different things and learn how to build and solve problems. 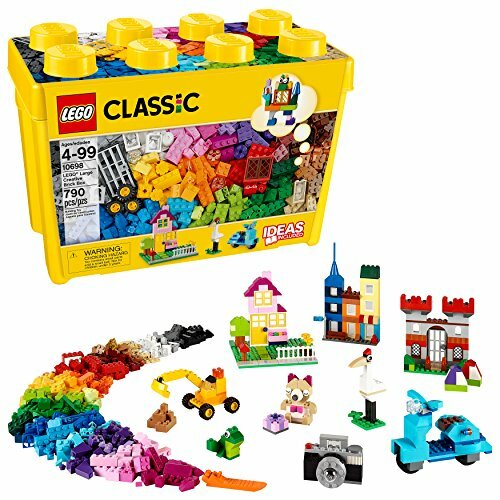 Bottom line: If you are looking for a LEGO creation set that will help your kids to focus and enhance their imaginations, then the LEGO Classic Large Creative Brick Box is a great option. Furthermore, your child can continue playing with this classic LEGO set even as he or she gets older. The final display is very stunning. They are nice to play with all day long. Compatible with other LEGO toys. Takes lots of time to put together. This is one of the best LEGO collections which have captured the eyes of many younger builders, and every kid yearning to get one as a pleasant gift. The set comes loaded with 375 building pieces which comes nicely packed and categorized in four numbered bags. Additionally, the sticker sheet included provides a tremendous collaborative activity for both the parent and the kid. This Marvel toy includes 4 Infinity War figures: a Bruce Banner figure, Falcon figure, Proxima Midnight figure with a spear and an Outrider figure. We really liked how flexible this set is for kids as it doesn’t include so many pieces which will make them feel overwhelmed. The most thrilling thing is that the children will be able to improve their coordination and become focused, rather than feeling frustrated and unable to finish the set. It needs more concentration, which is an amazing way to make your child’s imaginative and problem-solving skills flourish. 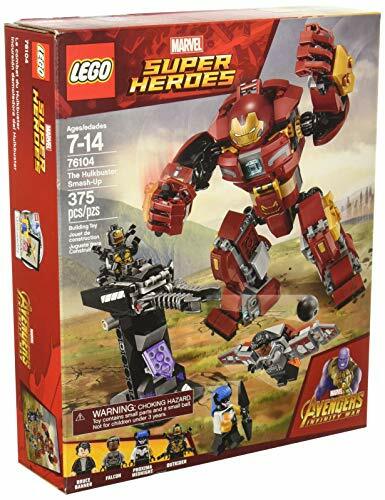 Bottom line: If your kids love Marvel superheroes movies, then the LEGO Marvel Super Heroes Avengers: Infinity War The Hulkbuster Smash-Up Set is the best buy for you. This building set is a fascinating gift for your youngest Marvel superheroes fan with its diverse mix of superheroes, and adorable design. Comes with a fantastic display stand and a decorative plaque. Takes some time to put together. 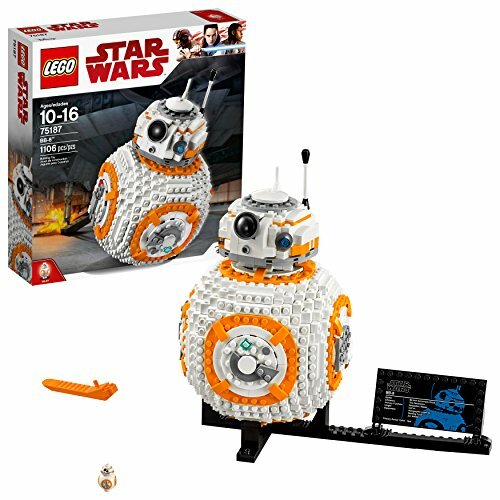 The LEGO Star Wars VIII BB-8 Set is a must buy if you love building LEGO kits and adore the endearing Droid BB-8 from the Star Wars films. The set comes complete with an authentic detailing and numerous attractive features which you can enjoy putting together for hours. When it comes to design, this cute little critter has so much to offer despite its compact size. First of all, the set features 1106 building pieces that are divided into six numbered bags and an instruction booklet to help you put together the toys. More than that, the BB-8 LEGO Set features a rotating head which can be activated by turning the wheel located on the droid’s side. This mechanism enables you to make the droid’s head face wherever side you want. Also, you can turn the wheel on one of the droid’s sides to pop the BB-8’s welding torch open for warding off the Stormtroopers. The BB-8 LEGO Set also comes with a display stand, and decorative plaque that allows you to put the Star Wars BB-8 along with the other Star Wars sets that you have. The Droid is probably one of the best-looking Star Wars Lego collections to have in your display. Bottom line: If you are an absolute Star Wars enthusiast and like putting LEGO parts together to create various Star Wars characters, then the LEGO Star Wars VIII BB-8 Set will be a great addition to your collection. Amazing Harry Potter LEGO set. Nicely designed and excellent quality building pieces. Extremely easy to follow step-by-step instructions. The final display is just stunning. Great way to stimulate the kids’ brain. Can cause choking when played around small children under 3 years. If you are looking for the best way to relieve your favorite scenes regarding Harry Potter and the Chamber of Secrets, then this LEGO Building Set will do the trick. The most interesting thing with this set is that it gives you the opportunity to create your own adventure from the Harry Potter saga. Both boys and girls will absolutely love putting together this thrilling, magical castle set. 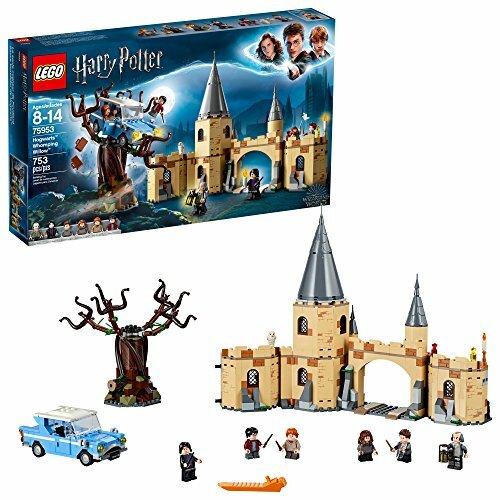 This brick-built Whomping Willow set comes loaded with impressive features to make your toy building more fascinating. Most importantly, it has spinning branches, a three-story castle design with a gate, and other accessories such as potions wands as well as some other magic LEGO pieces. Additionally, it consists of 753 pieces allowing your kid to spend hours building the Whomping Willow, Flying Ford Anglia car, Hogwarts castle, and other interesting items. Once you have finished creating the set, you can enjoy lots of action-packed features like putting the young wizards into the Ford Anglia card and flying them into the spinning branches of Whomping Willow, and then helping them escape to join Hermione at Hogwarts. And if you want to experience bigger mythical adventures, you can combine it with the Hogwarts Great Hall to expand the imagination. Bottom line: The LEGO Harry Potter and the Chamber of Secrets Hogwarts Whomping Willow Set is an excellent option if you are looking for something to keep you and your kids occupied the whole day. This building set provides a challenging yet an attainable building experience that is amusing for all ages. Overall, this set is the most amazing gift for the season. The finished product is very decorative. The booklet included is well-detailed. Putting together this set might be too easy for many LEGO fans. 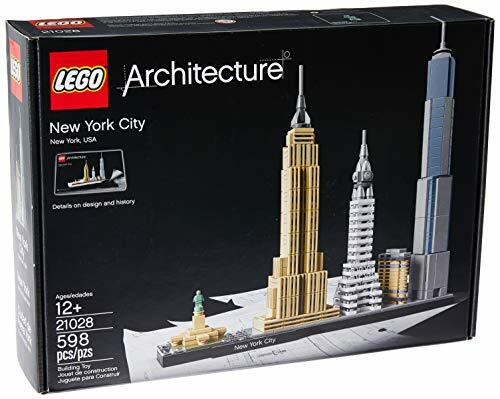 The LEGO Architecture New York City Skyline Collection is a great and stunning gift for kids over the age of 12 years old. With this set, they can put together a detailed model of New York City Skyline and also learn the important structures in the legendary skyline. Furthermore, the set provides five buildings: One World Trade Center, Empire State Building, Flatiron Building, The Statue of Liberty, and Chrysler Building. The booklet included discusses the history and construction of each of the five buildings, which makes it a great addition to the set. Each set is scaled to give an accurate representation of the comparative size of each structure, with the true-to-life color depiction. Once the kids have finished building the model, you can display their work in the house or even in the office. You can also transport it every time you admire the view. However, some customers complained that the kids they gifted this set to didn’t find it too challenging. Bottom line: The LEGO Architecture New York City Skyline Collection allows you to recreate the world’s most beautiful cities. Most importantly, it encourages focus and enhances creativity. Well-designed and excellent quality parts. Great gift for kids since it encourages creativity. The LEGO Friends Heartlake City Resort Set is one of the best LEGO sets under 100 dollars for kids available on the market. The package comes included with an incredible total of about 1017 pieces – hence, providing your kids with so many parts to put together. This set is a stunning option for keeping your kids engaged for hours. The most exciting thing about this set is that your child will be able to develop their coordination and improved his or her focus during the process. We also liked how the building toys are compatible with other LEGO building sets, which enables your kid to have more options to play and expand their adventure. With this set, there is so much your kid can do and enjoy. The box comes loaded with seven different numbered bags, an instruction booklet, stickers, and a printed plastic sheet. The four minifigures provided with the set: Stephanie, Andrea, Olivia, and Mason, plus a Sheen the dolphin figure are fun for your kid to play with. The resort hotel with a moving monorail to the beach waterpark is an excellent addition too. 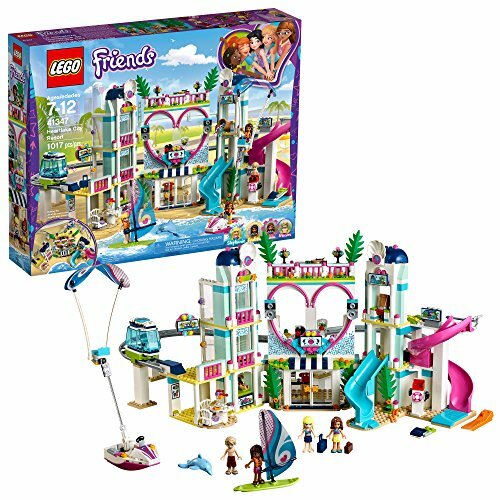 Bottom line: The LEGO Friends Heartlake City Resort Set will be a terrific addition to your kids LEGO City collections. Most importantly, it comes loaded with a lot of accessories that offers your kid hours of role playtime pretending to be enjoying a beautiful day at the water park. Overall, this set is a great buy. Keeps the child motivated `and focused. Unique design and excellent design. The different shapes and colors provide a fun way to learn. Putting together can be a bit complex for younger children. 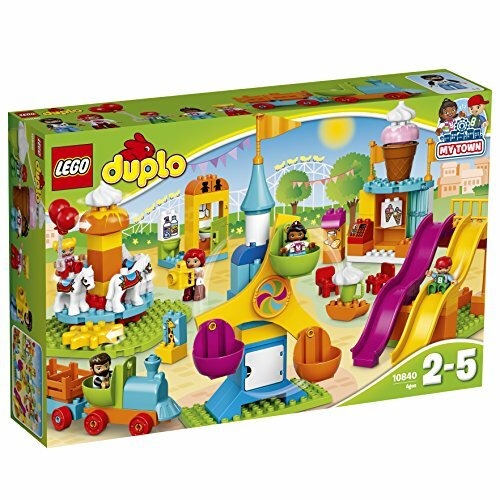 The LEGO Duplo Town Big Fair Set comes loaded with 106 large plastic LEGO building blocks and includes five LEGO Duplo figures which consist of two adults and three children. There is plenty of things to see and do in this thrilling set from LEGO. Firstly, it features a Ferris wheel with three vehicles and a turning function to help the kids develop spatial awareness during the process. This enables them to develop and improve their coordination throughout the play. Moreover, they will have the opportunity to utilize their problem-solving skills whenever they get stuck at some point. Once the set is complete, the kids can drive the little train and even visit the ice cream kiosk, detach a giant ice cream and give it to Mom or Dad to add in their LEGO collections. Other impressive features include the rotating carousel with four horse figures, two wavy slides, and train with a carriage for pretending rides on this amusement park building set. Most importantly, the blocking sets are compatible with all LEGO Duplo construction bricks, thus allowing your kids to have a growing collection of the different LEGO Duplo sets such as LEGO Duplo My Town Family House set, LEGO Duplo Town Big Construction Site, and many more. Bottom line: The LEGO Duplo Town Big Fair Set is something that girls will love as it promotes more creative as they play. Not to mention, the building set also encourages problem-solving abilities. All we can say is that this is a beautiful Duplo LEGO set for the price. Very enjoyable game to check your child’s creativity. Parts are excellent quality and durable. The visual effect of the finished display stunning. Could use more variety and bricks. Minecraft is considered one of the best-selling and top-rated games of all time, which are enjoyed by both kids and adults. As some point, most of us have played the Minecraft computer version, but the kids are the one who ultimately finds this game thrilling. Now, Minecraft has gone an extra mile of introducing the LEGO Minecraft The First Night Kit that will extend your eight-year boy and girl’s digital imaginations. With this LEGO set, your kids can put together a shelter and enclosure to protect the livestock, build a bed, oven, and a chest before the nightfall if they wish to prevent the hissing creeper. Most importantly, the building kit comes loaded with 408 assorted LEGO pieces, Steve with a weapon, a crafting table, a creeper, a pig, and a removable garden-rood which can be utilized to expand the exterior play area. 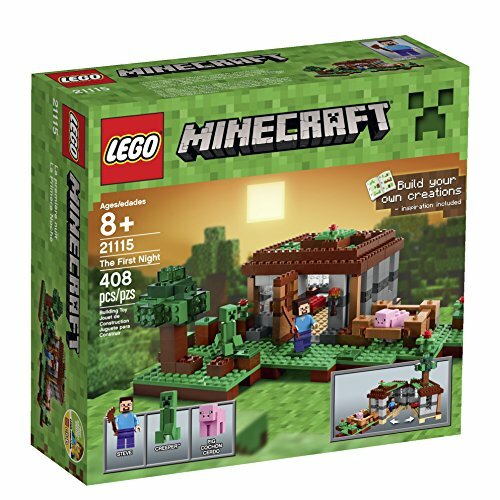 Furthermore, if your kid is a great Minecraft enthusiast, you may want to buy want to buy him or her another set like the LEGO Minecraft The Farm building kit for bigger Minecraft fantasies. The LEGO Minecraft The First Night is a delightful set which could be just what your kids need to introduce the kids into building real Minecraft adventures. Bottom line: The LEGO Minecraft The First Night Set is an amazing building kit for the younger Minecraft fans. This stunning set provides a unique set of variations and bricks which can be appealing to any creative user. Not to mention, it is compatible with other sets in the LEGO Minecraft series seamlessly. Lego is amazing, it’s creative, challenging and educational. Did you know that LEGO is a Danish company and was founded in 1932. Its founder, Ole Kirk Christiansen, created the name LEGO from taking the first two letters of the Danish words Leg Godt, that in English means “play well”. Any kid who gets a LEGOs set or collection will be happy, regardless of their age. These are games which can help them grow knowledgeably. Therefore, if you are looking for the best way to put those younger minds to work, then any of these LEGO sets will do the trick just fine. Any of the LEGO sets on this list will prove to be very useful and practical, and they will help your kids improve their imaginations and also increase their concentration. But our Editor’s Choice is the LEGO Minecraft - The First Night – this set will add a whole new element to your child’s LEGO world. So, what are you waiting for? Pick any of these best LEGO Sets and make your kid the happiest. Last updated on February 9, 2019 .